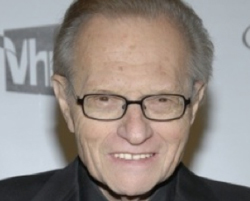 Larry King, who retired last year after 25 years at CNN, will be taking the stage in seven communities to dish about his storied career in a one-man show. The 77-year-old will offer theatergoers an inside look at his life and the ability to ask questions of the Emmy Award winner when “Larry King: Stand Up” kicks off April 14 in Torrington, Conn. The show will then make stops in Pennsylvania, New York, Maryland, New Jersey and Nevada, ending June 11 at the Mirage Hotel in Las Vegas. King was a weeknight fixture with his signature suspenders on CNN since 1985.